Posted by Carolyn Burns Bass in chick lit, weekly topics. Recent releases by pop authors Sophie Kinsella (Shopaholic) and the writing team of Emma McLaughlin/Nicola Kraus (Nanny Diaries), as well as dozens of other books with sassy heroines in wild situations, indicate that chick lit is certainly not a dying breed of novel. The term “chick lit” may be considered passé in some circles, yet devoted chick lit readers love the term and can’t get enough of these saucy stories. Join us this week in LitChat as we discuss this often misunderstood genre. Guest host on Friday is Jill Amy Rosenblatt, author of two chick lit novels, Project Jennifer (August 2008) and For Better or Worse (August 2009). 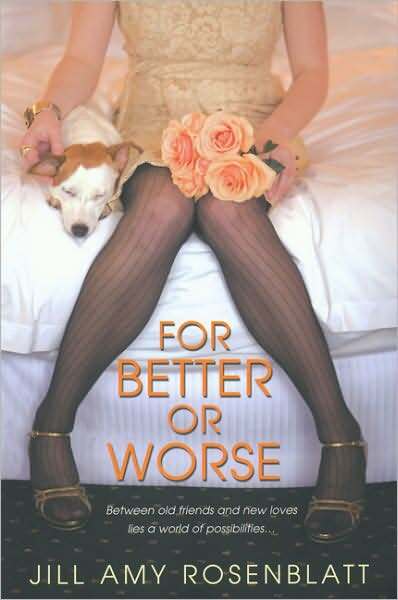 For Better or Worse drafts the life of three women through madcap adventures in business, romance and marriage. Rosenblatt lives on Long Island. She earned her Bachelor of Arts in Writing and Literature from Burlington College in Vermont.